From as early as Claudette Evans can remember, she’s always loved to draw, paint and make up stories. Having chosen music as a career, Claudette enjoyed her work-life years performing, teaching and recording and for leisure time enjoyed nothing better than spending time with her dogs. 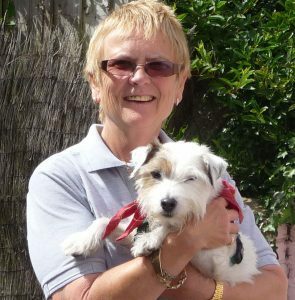 In 2004 a very special dog, Busby came into her life and she found a new passion – dog training! 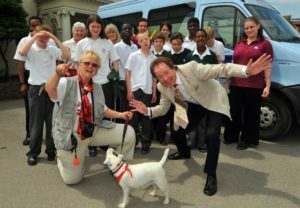 This new puppy turned out to be something very special, but I guess every dog owner thinks that of their pooch, but Busby was and like his human ‘mom’ became an entertainer and with a mixture of his skills at obedience and agility matched with Claudette’s music skills, they were soon in demand, performing to audiences at Fetes, Nursing Homes and Steam Fairs along the South Coast of England. This dynamic duo even appeared on Britain’s Got Talent. Sadly Busby crossed the Rainbow Bridge in 2014. Cutting back on her work-load, Claudette had already outlined many ‘Busby’ stories, the first being inspired by a visit to the Brecon Mountain Railway with her beloved Parson Russell and signed-up for a Creative Writing Course and was rewarded by having one of her short stories ‘A Cross to Bear’, NOT doggy related, but a 500 word story on life in a Dorset Workhouse, accepted by the Dorset Writers Network for their 2015 anthology ‘This Little World’. 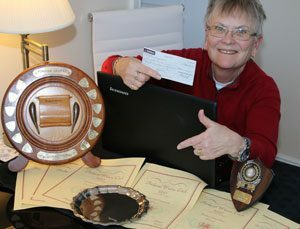 Retiring to Wales, Claudette joined the Bridgend Writers Circle and in December 2018 won the treasured Saviker Memorial trophy along with the Railton Shield and the Keith Coles Poetry Shield. Claudette is also a member of both the Bridgend and Porthcawl U3A Writing Groups, and has, for the past year been the compiler and editor of the Bridgend U3A Newsletters and Magazine and was equally delighted when another of her short stories ‘The Goblin Stone’, a 1000 word children’s Gothic Horror story, (no doggy involved) has been chosen for entry into Porthcawl U3A’s 2018 Anthology. Although there have already been many, many ‘dog’ stories written over the years and many children dream of owning a puppy, so Claudette realised the potential for a new angle to the ‘Golden Fleece’ genre. Imagine what it’s like never to be bored when your thoughts and artistic talents can transport you into a magical world of your own creation; to go wherever and be whatever you want to be, even if only on paper! So join 11-year-old Kaitlyn and Busby on a journey that will take you into a world of imagination and wonder.